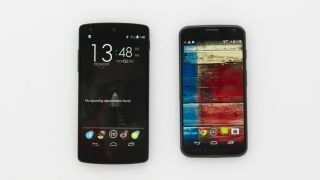 Nexus 5 vs Moto X: which is better? It's a good time to buy Android phones. With the likes of the Nexus 5, Moto X and HTC One, it's really hard to go wrong. The question is, which phone should you buy? We're going to compare two of our favorite Android devices - the Nexus 5 and Moto X - because if we had to spend our own cash on an Android smartphone today, it would boil down to those two devices. Although the phones have their differences, they're also alike in some ways. This might make the decision-making process harder, especially when they're both great devices. The Nexus 5 is a solid machine with some of the best specs you can find on an Android phone today. It has a sharp, 5-inch 1080p display, Snapdragon 800 with a 2.26GHz CPU, Adreno 330, 2GB RAM and all for a starting price of just $350 unlocked. That is incredible. On the other hand, the Moto X has a rich 4.7-inch -720p AMOLED display, excellent curvature and customizable design, active notifications and Touchless Control. The latter allows you to speak commands to your phone even if it's asleep, which means the microphone is always on. Let's take a look at the big features and see how they compare between the two devices. The Nexus 5 has a 5-inch, 1920 x 1080 IPS LCD display, which gives us a density of 445 PPI. Compared to other smartphones, its colors and contrast tend to look more washed out, and the display doesn't get nearly as bright as the HTC One or iPhone 5S, for example. However, whites look white without having too much of a bluish or cool tint. And the display is very sharp, which makes watching movies and looking at photos a real pleasure. The Moto X has a 4.7-inch 1280 x 720 AMOLED display, which offers deep blacks, rich colors and contrast and generally warmer hues. It has a density of 316 PPI, so it looks sharp enough when you're holding it at normal viewing distances. Which display is better? Well, it all becomes a matter of preference. The Moto X's AMOLED display is very rich when it comes to color and contrast, and it also draws less power, which helps the Moto X with its great battery life. However, we also like the Nexus 5's larger, razor-sharp display. Without another smartphone to compare it to, the colors and brightness are just fine. It's only when you compare it directly with the Moto X or HTC One that you begin to notice its slightly washed out colors and contrast. It's a toss-up between the two, but many seem to prefer the Moto X's display even though it's not as large or sharp as the Nexus 5's screen. At the moment, and until Google fixes the camera on the Nexus 5, we can easily give this one to the Moto X. The Moto X has a 10MP rear camera, while the Nexus 5 has an 8MP shooter. Of course, megapixel count isn't everything, but it's the way each camera performs along with the native camera interface. We found that the Moto X had a much easier time focusing in situations where the Nexus 5 struggled to find focus. In fact, the Nexus 5 would sometimes take seconds to focus even in bright, high-contrast scenes. Moreover, there is a considerable amount of shutter lag on the Nexus 5's camera, whereas the Moto X was quick to start up and take shots and go from shot to shot. Motorola also updated its camera software recently to allow you to drag its focus indicator to select your focus and metering point. The Nexus 5's native camera software can be frustrating and confusing, especially for first-time Nexus users. There aren't many settings available, and they're hidden or buried in certain actions that first-time Nexus or Android owners might not find.